What do you think of these? I was inspired to make them when I saw the flyer for the upcoming exhibit from the Folk Art Museum, Infinite Variety, Three Centuries of Red and White Quilts. I’ll post more about this later, but will just say now that I am inordinately excited to go and see this in March. I imagined a quilt with little rows of tidy houses, but thought I’d start with a few blocks, just to see how they looked. My husband, who is usually very complimentary of my crafts, said, “Um.” Not good. It turns out that he finds the houses not charming but creepy. Why? There’s no door, for one, and even worse in multiples they look like sinister barracks. (They are also very fiddly to make, so another strike against them.) But, I’d still like another opinion. Charming or not so much? I’d say very charming. the doors might be on the other two sides, or perhaps one of the windows could become a door. did you silk screen them? Thanks! They are pieced cloth–hence the fiddly-ness. Lots of tiny pieces of cloth stitched together. Maybe the hubby has watched too many creepy movies! I admire the fiddliness required here. Amazing. And they are dear, not drear. Well, he has been reading Unbroken, which in part takes place in a Japanese POW camp. 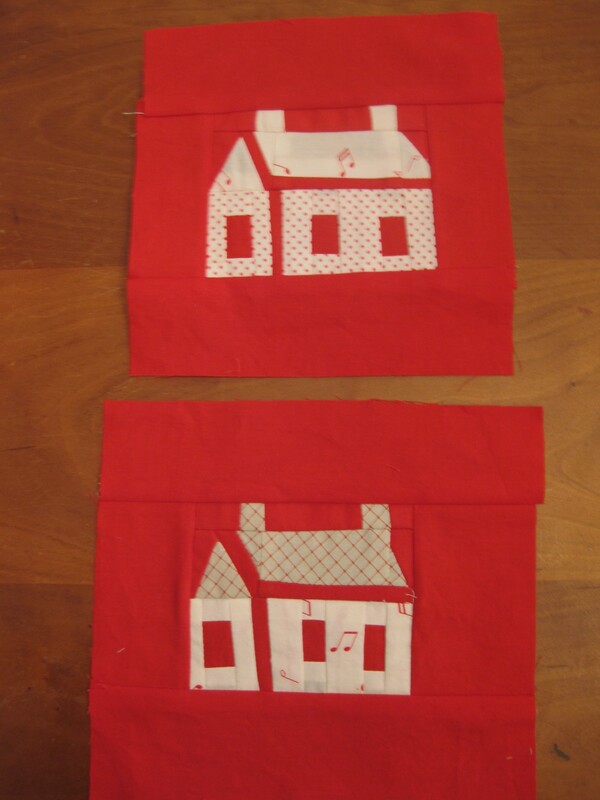 I am debating whether to turn these into 1. another table mat 2. potholders 3. quilted sewing machine cover. Too pretty for potholders! Maybe place mats? That was my original intent, but was deterred by the lack of enthusiasm. Maybe I will just forge ahead.